Just as the leaks predicted, Microsoft has announced the Surface Laptop as its latest piece of hardware. Unlike Microsoft's other devices, the Surface Laptop is a straightforward clamshell computer with no tablet mode whatsoever. It takes qualities from Microsoft's two other devices, including the Surface Book's 13.5-inch PixelSense display with the microfiber-covered keyboard taken from the Surface tablets. Microsoft claims it has introduced the thinnest LCD touch module on a laptop with this Surface device and it features 3.4-million pixels. Externally, the laptop is made of a combination of magnesium alloy and the flocked Alcantara material imported from Italy. Despite the differing materials, Microsoft's Panos Panay promises you won't find a single seam or screw anywhere on the device. Likewise, users won't find a single streak of light leakage on the keyboard backlight. Users will also appreciate the 1.5mm of key travel. As with other Surface devices, Microsoft's clamshell laptop works with the Surface Pen and Dial. In terms of size and weight, the Surface Laptop measures it only weighs a mere 2.76 pounds and measures 1.45cm thick at its thickest point. So when will the Surface Book 2 come along? The Microsoft Surface Laptop features the latest 7th generation Intel Kaby Lake Core i5 and i7 processors. The Redmond company also claims it has pushed the storage envelope forward by mounting the PCIe SSD directly on the motherboard for the first time on a laptop. To top it off, Microsoft promises 14.5 hours of battery life and a Surface device that finally sleeps properly - so you can close the screen before heading off for Spring Break, and you should be able to open it on your return and still have the same battery life left. To aid in cooling, the bottom panel of the Surface Laptop is etched with Vapor Chamber lines. 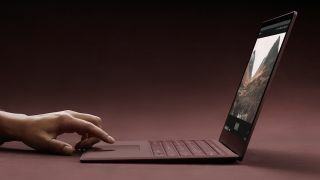 The Surface Laptop comes in four colors and can be pre-ordered right now, starting at $999 (about £770, AU$1,330) with an Intel Core i5 processor, and it's expected to arrive by June 15.